Expansion, Record or Not At All? We are closing in on a record for economic expansion. It’s been talked about more frequently, especially since one has already been reached in the labor market. According to the BLS, there hasn’t been a negative employment report since September 2010 (there was one in September last year, but it has since been revised to slightly positive). That’s 93 consecutive months, but does it even qualify as expansion? 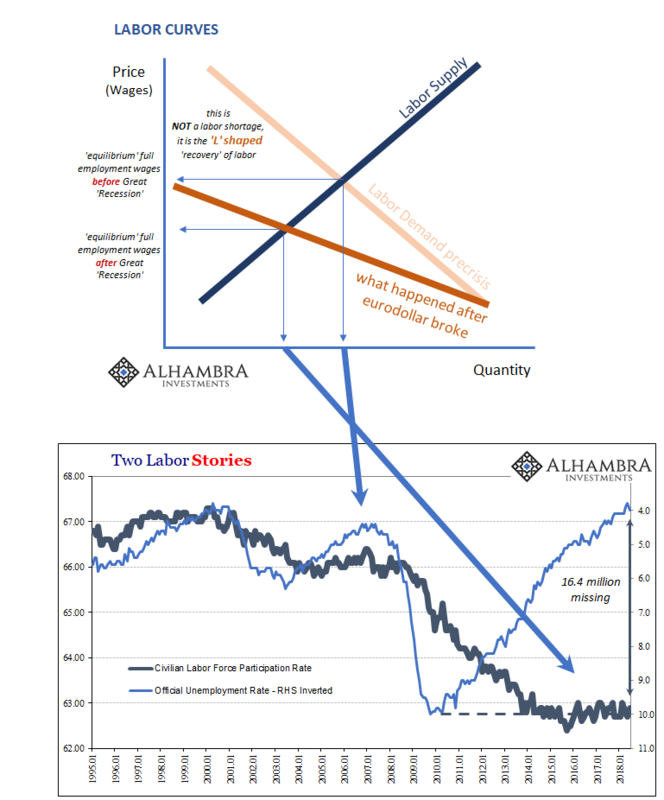 If you factor in the entire labor market and all those who might be missing, no it’s not. The number of jobs presented by American employers is surely gaining, but the criteria for expansion isn’t one dimensional. There are more Americans at work today than at the end of 2007, but barely more. That’s the problem in a nutshell. We find the same deficiency all across the board; from GDP to something like new orders for durable goods. 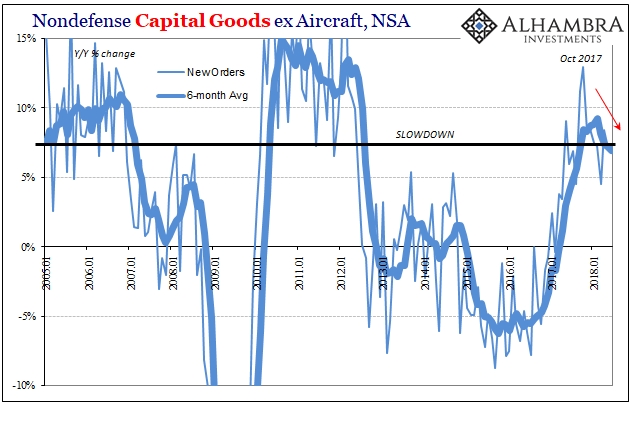 For the latter account (excluding transportation industries), the record high for a single month was reached in June 2008, $167.3 billion seasonally adjusted, and has yet to be matched. For June 2018, exactly ten years later, the new estimate, released today, is still just slightly less than that; $164.2 billion seasonally adjusted. How can that be? 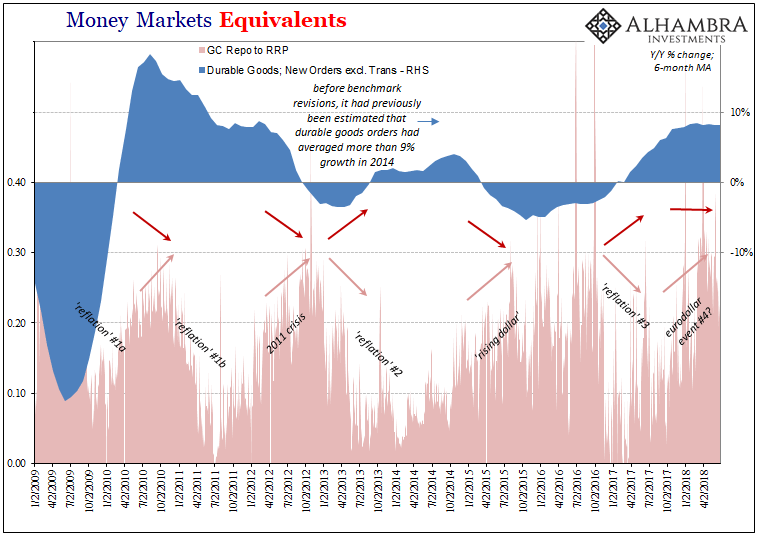 The economy as a whole may be approaching a record length of expansion according to the NBER, the cabal of Economists who decide these things, and whose word for some reason everyone simply accepts on the topic. But as you can see it’s not really consistent expansion. As with everything, the upswing is interrupted several times by “something” that nobody seems able to put their finger on. 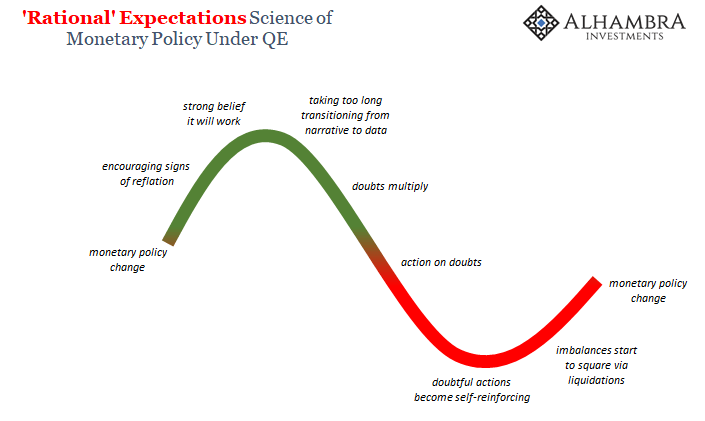 With central bankers declaring the monetary system free and clear from suspicion, we are left with few plausible alternatives. It’s an expansion in name only for reasons that aren’t available in mainstream commentary. It may be already, but it’s difficult to parse given a few potentially large distortions. The first was the hurricanes almost a year ago that I’m as sick of bringing up several times each month as you are of me doing it. 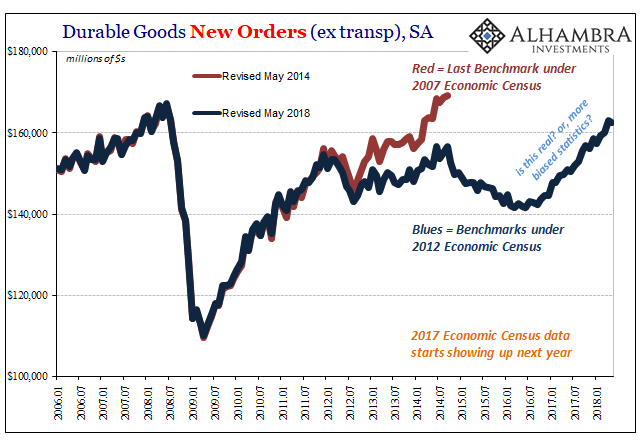 The other is what is almost certainly boosting tomorrow’s GDP number: activity moved forward especially in the goods economy to try to circumvent any significant tariff and trade restrictions before they are imposed. 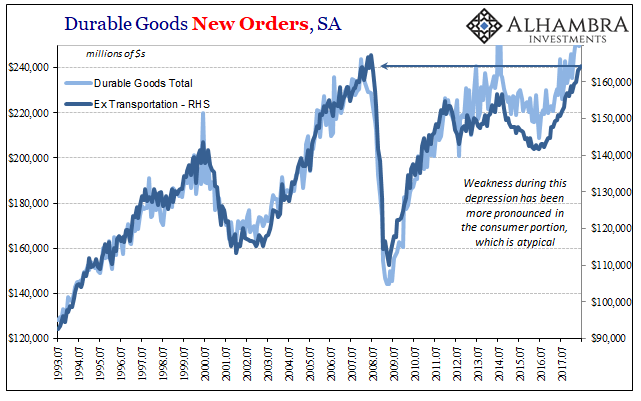 But as with the median sales price of new homes, the durable goods data is only slightly suggestive (before taking account of these distortions) of this upturn rolling over and nowhere near conclusive of it. 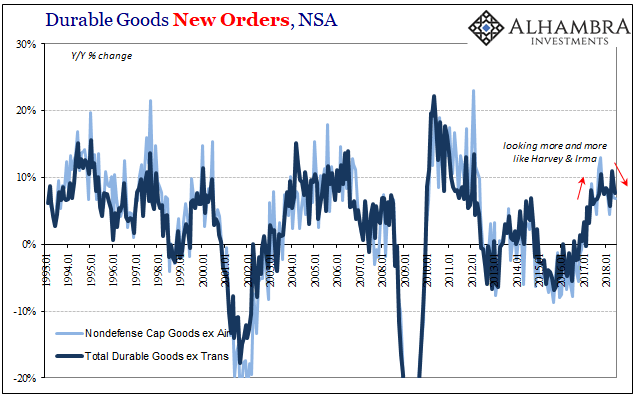 That may be also related to one additional potential misrepresentation that likely wouldn’t be revealed until years from now; the statistical bias that in durable goods has been enormous at times, especially three years ago under largely the same circumstances. It’s the repetition more than anything that warrants our attention. We can’t know for sure, though overseas economic indications are further along in rolling over, but the suspicion can’t be ruled out. If the economy was truly booming, hurricanes and tariffs wouldn’t even register. A real expansion is unquestionable like that.